The sight of a bald eagle is very rare. When someone spots one off in the distance, there is instant excitement in the air! 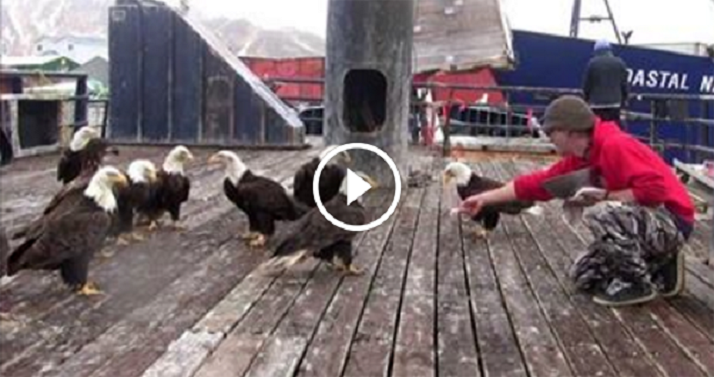 So that really makes this video incredibly special, as here is a guy, Alaskan fisherman Jessie Peek, who actually is hand feeding a massive flock of bald eagles who are right in front of him! As the camera pans, it turns out they are all over his boat too! This truly is a rare experience and it’s a trip watching so many of these majestic birds gather around Jessie for their daily snack. Share this awesome video with all of your animal loving friends and family!